^ "Survey of Admission Rules in Federal District Courts" (PDF). 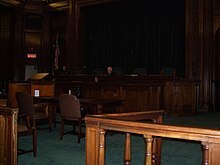 U.S. District Court for the District of Maryland. 2015. Retrieved October 16, 2017.